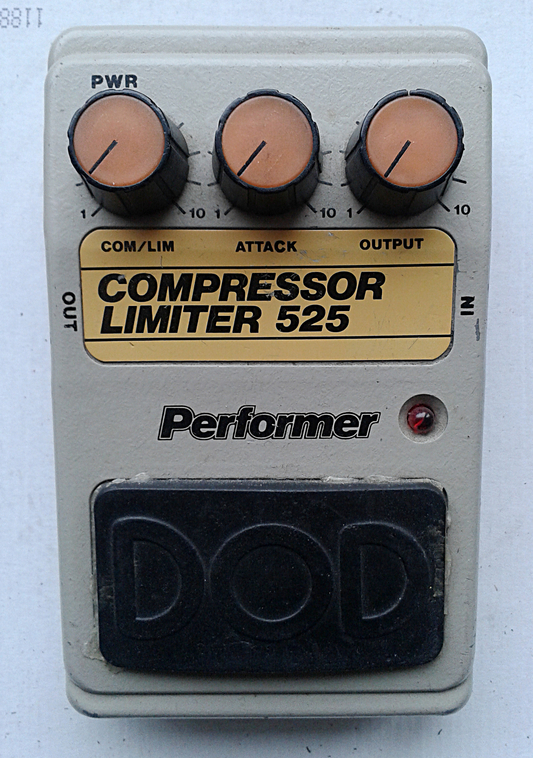 DOD 525 Compressor Limiter from the Performer series. Made in USA in early 80’s. My first contact with any performer series boxes was with 525A Compressor and a few other i serviced a while back. At the same time someone was selling this unit for a very decent price. And since i’m quite fond of all DOD units, i just had to get it. I have not seen the original battery door on any of the performer series units yet. If the older FX-series units are prone to lose their battery doors, this series is even worse. The battery compartment is designed to hold two 9V batteries, so the covered area is way bigger than in FX-series. Which then means that the plastic clip design is even worse. There is some crude beauty in the Performer series, both inside and out. The board represents the same type of hand made mojo as the first series boards. No ground fill and everything looks, well. Hand made. What comes to the electronics, we have a CA3094 OTA based compressor that’s not too far off from any other OTA compressor of the era. The 18V operation is the thing that separates this from the most. There is an old factory schematic scan up at FIS. The biggest weirdness is with the DC connection. Sure, the 18V requirement had to be addressed so it wouldn’t be confused with the 9V supplies that every other pedal series wanted. But to go with 6,35mm guitar plug was probably not the greatest choice. Good thing though. The jack has about 11mm hole diameter, so swapping it for standard 2,1mm, 12mm barrel bodied jack with a switch is easy to do. Haven’t swapped the one on mine yet, but i’ve done it for a few other pedals. This series is the ultimate example of 9V vs. 18V. It may offer unwarranted hazzle to have two different voltages on your board. 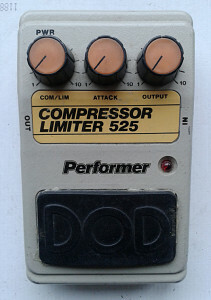 But..
Nearly the same as most good OTA compressors out there. With exception of higher headroom, level of presence and studio quality compression. Dynamics are richer and without the knowledge of the voltage in play, there is something quite magnetic about the tone. Almost magic. Decent level of boost and sufficient controls. Yes. This unit can take on any modern compressor. Maybe the signal to noise ratio could be better, or the general noise floor lower. This is not meaning that the unit is noisy in any way. It’s just that i tried to think what would be the negative thing to mention. There is very little wrong with this compressor. If we disregard the missing battery door and the original, weird power connection, we have amazing sounding vintage effect on our hands. former linux enthusiast (nowadays just a hobbyist) turned analog audio electronics enthusiast. 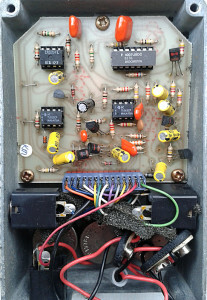 pedal builder and collector. loves his missus, dog and a few other things in his life - like good punk rock, good food and tons of good beer. but only if the beer doesn't happen too often. Found an error? One of my assumptions is dead wrong? Something else is just not right? Let me know! Leave a comment to a post, or drop a line to mirosol at kapsi dot fi. I do mods, repairs and custom builds too. For inquiries, use the email address above. best viewed with open source (or free) browsers, with terminus and liberation sans installed. Also, i strongly recommend using DuckDuckGo! for your search engine, as it doesn't track and collect information about your internet usage. Please remeber to take care of your privacy here on the internet. Entries (RSS) and Comments (RSS). 34 queries in 0.123 seconds.